Where do you normally store your favourite pen or pencil? Do you just leave it anywhere on the desk and later hunt for it all over the place, only to find it after you've begged for a new one from the office secretary? Not easy to explain why you've lost another pen after only one week, right? Most people would have a container to put in their stationery. Anything that looks remotely like a cup or a tray would normally do. And most of these are made of plastic. I never used to bother where I put my pens, but now I put them in a pewter caddy (or pewter pen holder). A very nice one, in fact. It certainly makes my desk look better and I've got some nice comments from my colleagues. I got it as a gift from a customer as a thank you after I gave them a talk on conductive plastics over in their plant. I like the designs on all four sides. Each side represents one season. Spring is represented by the tress peony, while the lotus symbolises summer. The chrysanthemum brings in autumn, followed by the plum blossom for winter. These flowers are very much cultural symbols of the Chinese and you can actually see them in many oriental paintings. The quality of the artwork on all four sides is admirable. I got another caddy recently, again with an oriental nature theme. I guess there's something about nature and seasons that attract me. 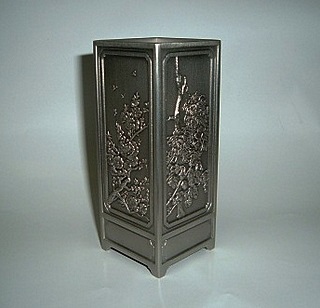 This caddy is one of the items in the 'Four Gentlemen' collection. Each 'Gentleman' is represented by a flower or a plant, and these are the plum blossom, orchid, bamboo, and chrysanthemum. Each one is said to symbolise the qualities or traits of a gentleman or scholar. For example, the chrysanthemum is said to personify simplicity, honesty and perfection. My other half also got into the habit of giving pewter gifts to friends and colleagues. She gave the pen caddy below to her boss who left her company for greener pastures. It's personalised on one side, not shown here. 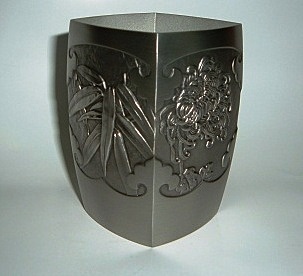 You can easily find a pewter caddy that suits your taste out there. So why not make your desk more interesting? Who knows, it might just get that beautiful colleague who's been ignoring you to start chatting with you!